This article about the uses of Osmo oil for treating wood, was written by Traditional Painter for Stafford, Martin Dunn. As a former college lecturer and assessor, he has a great deal of indepth information to share. Over the last couple of years I have been using more and more Osmo oil on interior timber, worktops and furniture. The product I turn to the most is the polyx-oil original interior wood finish, which comes in both a clear satin matt and matt finish plus tinted versions (more later). It’s a hardwax oil which combines all the advantages of oils and waxes in one product ie it goes on like a traditional varnish or oil but gives the appearance and durability of a wax. It is resistant to water, dirt, wine, coffee etc and is microporous, so will not crack, peel or blister. I think a lot of people will know it as a natural wood floor finish. At the moment I have been using the rapid version of the polyx-oil which is touch dry after 2-3 hours (dependant on conditions) and re-coatable in aprox 6 hours. The original needs overnight drying. The property I have been working on has just had a loft conversion, and because of regs needed fire doors fitted on all the stairs and rooms leading off from it. They also fitted a new bannister and spindles which the customer wanted matching to a piece of furniture. 1 – The bare timber doors receive a first coat applied with a slightly worn natural bristle brush (don’t use a new one, you will spend most of your time picking bits of bristle or the tip ends, the flags, from the applied osmo oil). You could also use a synthetic brush or even a painting pad, but I prefer natural bristle for this. 3 – The second coat is applied – and thats it! No thinned primer coats; no 3 coats to build it up; no top coats of wax applied by rags or mops when finished. The bannister and spindles received 2 coats of matt woodstain in antique pine, followed by 2 coats of Osmo Oil. As I said, the client was trying to match the new installation to some existing furniture. The customer went for a satin matt finish in the Polyx Oil, but it is available in a matt finish as well. If you wanted a totally flat matt finish, I would probably look at the Polyvine products which have a “flatter matt” finish. It only needs 2 coats to bare timber, and goes a long, long way! To give you an idea, on the stairway there were 10 doors – both sides had 2 coats – plus the bannister and spindles. The first coat, being on bare timber, soaked up more product than you would expect if oiling a previously coated surface, yet all this work was completed with just 2.5 litres of Osmo Oil! As a specialist kitchen painter, I also offer clients additional options for upgrades, and Osmo do a specific product called “Top Oil” for worktops, which I have successfully used. So, after stripping existing coatings back to the bare surface, I apply 2 coats in the same way as described above for doors. It needs to be left overnight to dry between coats. Osmo oil also offers a natural alternative to other wood treatments such as linseed oils, danish oils, teak oils and the highly effective but often overlooked tung oil – they all still have there uses though. Osmo oil – Not just for floors. Paints and Interiors are Osmo stockists and we are very impressed with the product knowledge of Ben, the owner. The overall level of service is also top drawer, from advice to orders to delivery, so well worth dropping in online, if you are in the market for Osmo wood care products. (See other Trade Corner associate suppliers, like Paints and Interiors. I have some pine dipped doors which I have coated in the past with oil – danish, linseed etc. Can I use Osmo wood wax finish high solid now. I plan to wash the doors down and paint when dry. Is there a big possibility that they would come out lookng worse? I want to smarten them up. I have chosen Cherry coloured to brighten up the colour which, having been chemically dipped in the past, are not a great colour. I went to an outlet here in Norwich and they did not issue warnings when I said I had used linseed oil and when I asked about preparing the doors, they suggested sugar soap wash. I also have Danish oil here and a ronseal furniture oil. I want to nourish and protect so, in my world, I would think about feeding with oil and then putting the wax on top. I would like advice before I open a 25 pound tin of woodwax. I do not want to make things worse. I have never actually used osmo oil before as its not something that my local paint shed actually stocks. I have a job to price for and after reading your blog I think I will try this product out! Thanks for taking your time to post this information. Wait till the Danish oil has hardened, i.e. this is when any water drops bead on the surface. Hi, thanks for the review. I’m literally between coats of Osmo topoil natural on some new ash worktops to be used as a desk. I’ve applied very thinly using a cloth as directed on the the tin. Am I missing a trick by not using a bristly as you suggest? I did notice my rag drank a lot of the oil which is a bit of a waste! Finish is nice but winter of it will be too thin even with two coats? joiner asked for Osmo oil for skirting and architive can you let me know what i need. I wouldn’t. Old paints and lacquers must be completely removed. Thanks for reading and glad you can take something positive from the info. Hello. We have a pine floor in our kitchen that needs to be re-sanded and finished. 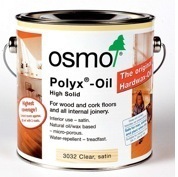 One floor specialist has recommended Osmo hardwax oil. Another has said that because of the different sanding tools used to get around radiators and into corners etc, the oil will show up all lines from the sanding. The only way to avoid this is to sand down to such a smooth surface that the oil does not take. We are confused as to which is right, and would appreciate any thoughts. We’ve had Osmo Polyx-Oil High Solid 3044 Raw transparent put on our oak floors and in the more trafficked areas it’s coming off although we had it done less than 6months ago. On most areas we have 3 coats. What should we do about this? We expected it to be an oil which would sink in but it sits on top of the wood despite it being well sanded. The osmois a terrible product. A better one is treatex. We used osmo in out kitchen and it lasted a month or two. We put polish on top to help it but it eventually needed redoing. We used a product called treatex. Very similar oil byt far superior. It leaves a finish that last for years. I mean in my bathroom it is now 5 years old and the wooden floor still looks ghe same. I used Osmo wood wax finish on a new maple worktop. The fitter told me to reapply after 3 months, which I have done, but it doesn’t seem to want to absorb and I am left with sticky worktop. Should I have reapplied? If not, how long should it be between reapplications? As a rule of thumb, I think clear finishes should be recoated if they need it, rather than stick to some sort of time scale that may not apply to the amount of wear and tear on the surface. So if water has stopped pooling or there are unsightly scratches, or the surface is looking faded, clean, degrease, lightly abrade, clean with a tack rag and reapply a coat. I have used Osmo polyx oil for years on an oak front door. It is easy to apply (needs 2 coats). It does not flake or peel, just wipe off dust before applying a maintenance coat every two years. My front door, as many others, was in a challenging position – full sun all day long – very hot in summer. When I saw Osmo UV stabilised oil I tried that. Unfortunately the challenge was too great – it did peel after exposure. So stick to ordinary osmo oil and you can’t go wrong. I had also used sadolin classic antique pine on my pitch pine windows – excellent – wipe off dust and apply maintenance coat every two years. Weather does wash off Sadolin so one year I tried putting Osmo on top of the Sadolin. OK, but when later I applied Sadolin on top of the Osmo – what a mess – the Sadolin was dissolving the Osmo – so don’t try that. My present conundrum is this – I’ve bought veneered interior doors from LPD, meranti I’m told. Reddish with red fibres. I’m putting Danish oil on but after two coats I know I’m not getting the look I like. Does anyone know of Osmo polyx oil will go happily onto Danish oil? Thank you. Good info in there Irfon, thanks. I have no personal experience of Polyx oil over Danish oil, invariably starting from a clean substrate or recoating Polyx over itself. Thinking aloud, can you not do a test on a door edge? To get a fair result, it is probably best to let the Danish oil cure first for a good 30 days so the linseed oil / tung oil have dried thoroughly. If the test doesn’t work, you can always sand the edge back to the bare and have another think. You could also contact Ben Sturges at Ray Munn in E Anglia he might know more. PS In my experience you shouldn’t apply anything on top of Osmo polyx oil. It does the job all by itself, and a maintainance coat should be easy to apply after cleaning dust and grease off the surface.